I have been having problems logging on but it seems that I am making some head way. Today my sister and I went to the used book store and we purchased the audio book Saving Fish from Drowning by Amy Tan becasue we traded in The Bone setter's daughter by Tan and also Ten Big Ones. I also got the book Resistance by Anita Shreve, I've heard the audio book The Weight of Water so she's a pretty good writer. On projects the first sock is getting done and same with my jacket. On spinning I need to purchase more pink fiber from Denware Studio to complete the second glove for Jun. As for pictures I'll hopefully be able to post them this weekend or this week coming up. So that's itm I'll be posting again soon. I have been sick again! Last week the crud came back and came back hard, running a fever and not been holding anything down it has been rough. Thank goodness I have next week off I can relax, (still do homework) but relax all the same. So here are some pictures of projects that I have been doing. One is of the Debbie Bliss Celtic Knit the chille jacket, Emily's fingerless gloves, the two huge wool balls, one completed fingerless glove for Jun. I'll be posting more this week because I'll be dyeing the wool. I have been sick for two months! Which has not been fun at all. I have been doing papers, tests, this month has been keeping me busy. Emily's gloves are finally done! I'll be posting them next weekend when things have settled down from school. I am now making Jun's gloves, I visted a store called Denware Studios. 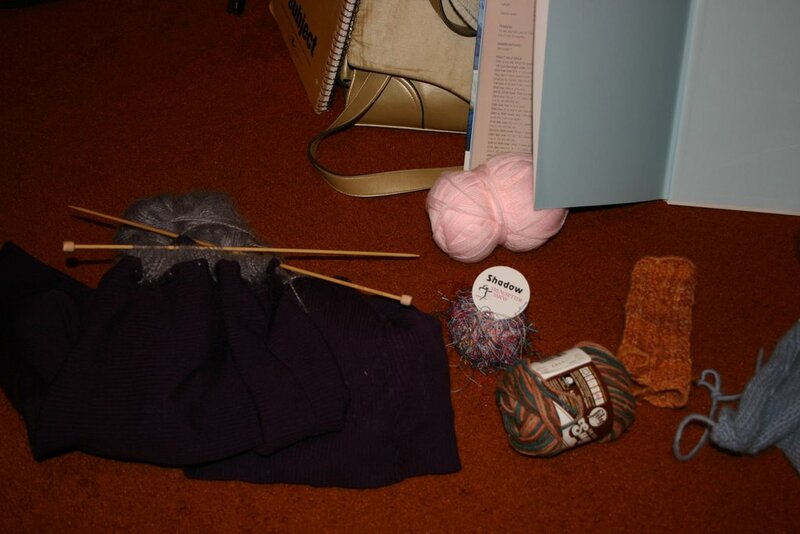 I bought a new tool for spinning and bought some nice green wool yarn and an ounce of pink fiber that I am combining with the brown for Jun's gloves. I have the first part of my jacket done now working on the second. Also picked up a large ball of yarn to make Grumperina's socks which were featured in the this issuse of Interweave knits. I also bought some fiber from If you love to spin a dream, super wash merino a nice white. Last night I saw a book at the Yarn Lady, that I am going to save up for, Spin to Knit, I saw this shrug that I want to make. True it's going to take some time to spin but I believe it will be worth it. Also from the store owner from Yarn Lady Gaby I bought two very huge fiber balls. I don't know what to make yet, but over spring break I plan to dye some of it and see what colors I can get out of it. That's it till next weekend. It seems it's baby season, a family on our street is expecting a new grand child and we saw some people at our community college some old tutors and councelors so we're going to be busy making new knitted materials for them. I have already finished two baby mittens, I plan to make a baby blankets and one or two simple clothing. Emily's fingerless gloves are almost completed and soon I'll be starting Jun's gloves. The first part of my jacket is almost done, soon I'll be starting on the back and sleeves. Next week we start the grind again, school and also I'll be starting an internship so this should be a good semester. This past Saturday my sister and I went to a "sleep over" at the Yarn Lady, from 6 p.m. to 12 a.m. We got there early but left about 11:30 p.m. it was a lot of fun. We won some needles and four balls of yarn and there was about four or five tables filled with women and their projects. As promised here are some pitures od the projects that I am currently working on. The jacket from Debbi Bliss, one fingerless glove complete, and an old sweater that my sister cut that I am knitting on. So far these projects are going well, and I am enjoying listening to the podcasts of Cast-On so I hope that this week to post more. Till then, I'll post more pictures of the projects. So I lied, I have been enjoying taking time off. My sister and I saw the movie "Children of Men" and it was really good, very scary as in this could happen in our society if we're not careful. I have been working on projects and this week I am determine to post pictures to show everyone what I have been working on these past few weeks. Right now I have been listening to Barnes and Noble authors interviews, some samples from Random house audio books and cast on. So this week I plan to post pictures, so be looking out for those. It seems I can blog again, I was a little confused with Google accounts but I believe I got it down now. 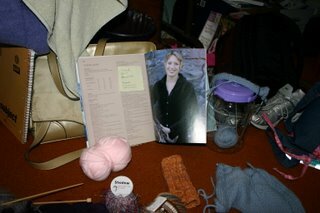 I have been knitting and crocheting. Right now I an working on fingerless gloves for my sister and spinning the yarn for the rest of it and also trying to finish up the felted pursue. 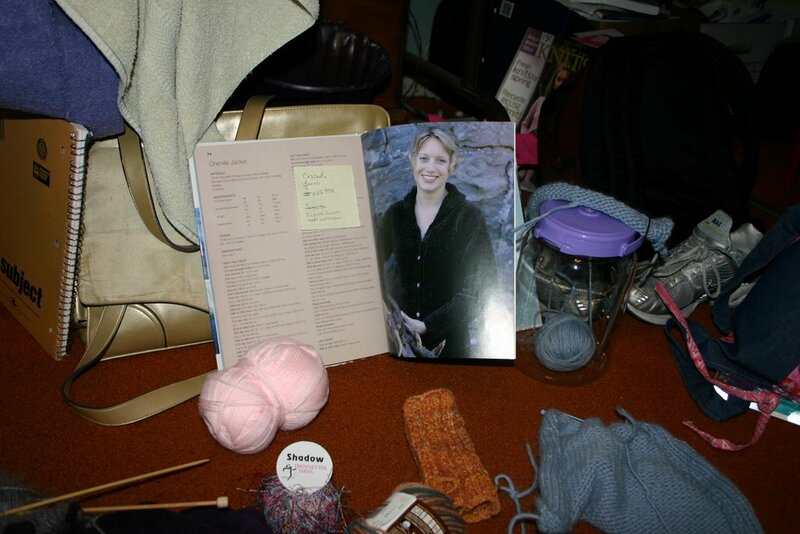 Now that I have a iPod I have been downloading podcasts such as Cast On and New York Times Book Review they're good when I am working on stuff like knitting and spinning. I plan to post pictures this week and show everyone my work.